Fantastic ocean front view, this beach front condo features a very comfortable California king-size platform bed, queen size sofabed, central air conditioning system, and an entertainment center with digital HD flat-screen TV, DVD & surround sound, free WiFi. The full kitchen has all the amenities, and a stackable washer & dryer are conveniently located right in the unit. Living room features floor-to-ceiling & wall-to-wall glass sliding doors, allowing you to fully take in the glorious sights, sounds, and smells of the ocean. From the lanai enjoy sights of turtles, whales (in season), canoes, and the West Maui Mountains. Snorkel, bodysurf, boogie board, swim, and canoe right out in front of the condo. Sugar Beach Resort has its own webcam! Just search for the website called sugar beach webcam, as URLs are not allowed on this listing. Sugar Beach Resort has lush, well-maintained grounds and one of the nicer swimming pools & BBQ areas in Kihei, along with a Jacuzzi, wading pool, sauna, sundeck and putting green, all in full view of the ocean. Many guests choose to use the oceanside BBQs and dine at the outdoor tables, meeting old & new friends. Book activities and rent water sports equipment at Maui Sights & Treasures which is located on the premises. Dina's Sand Witch Shop serves great food & drinks. An ABC Store & farmer's market are located just up the street. Sugar Beach Resort is centrally located, which makes it convenient to venture out to other parts of Maui. If unobstructed ocean views and privacy are what you are looking for, this fifth floor location has it all. CANCELLATION AND RESERVATION POLICY: A fifty percent deposit is required at the time of reservation, with the balance due 60 days prior to departure. Reservations are 100% refundable if cancelled at least 60 days before the arrival date, and 50% refundable if cancelled at least 30 days before arrival date. All sales are final and nonrefundable for cancellations less than 30 days prior to arrival. NON-SMOKING POLICY: There is no smoking inside the condo or the condo lanai or in the covered walkways, per Hawaii state law. Smoking is not permitted in any 'enclosed or partially enclosed' area, including lanais (balconies, pool area, covered walkways, or central patio). Guests who smoke in unpermitted areas are charged a $475 fee by the management and a $50 fine by the city. This condo is managed locally by CRH Maui . HI tax cert #TA-143-477-1456-01. (Information required by Hawaii State law). We live on an island in the Puget Sound, and so we feel right at home in Maui's island setting. The peaceful pace and friendly atmosphere really appeal to us. For many years we had been staying at Sugar Beach Resort and are thrilled to own a condo there. Our goal is to make it your favorite home away from home. You just can't find a place closer to the water than a Sugar Beach oceanfront unit. The view is unparalleled and you have front row seating for whale watching much of the year, and turtles all year. Sugar Beach is nearly 6 miles of white sand, and wonderful for walking, jogging or beachcombing. The north end is never crowded, so you really feel like you have your own piece of paradise. Some spices, salt, pepper, sugar, etc. Unit 527 was very well appointed, and had everything we needed. It was clean and well kept, and the location can’t be beat! April was amazing to deal with and responded very quickly. Would definitely recommend! 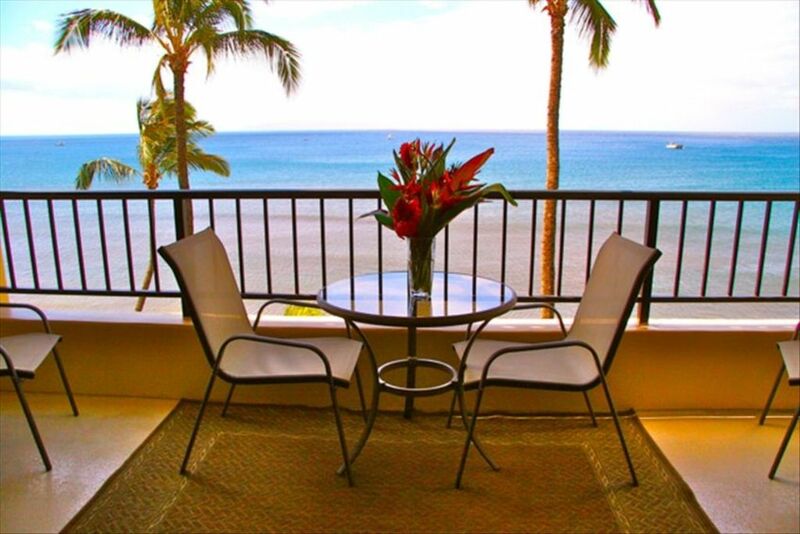 I always enjoy an ocean front condo, there is so much to watch from the lanai. The condo was neat, clean and stocked well with beach gear. We appreciated the backpack beach chairs and cooler a lot. Although the bed was tall (it has under bed storage), it was not hard to get into for us (5’6 and 5’8) and it was very comfortable. Really liked the double closet space to hang our clothes. We found it very handy to have a combo lock on the front door instead of a key, we never worried about losing the key or locking ourselves out. The book library is well stocked and we used the few Maui guide books to help us plan our days. The only thing we needed but didn’t have was a note pad and pen. We would definetly stay here again. Great view, perfect location and everything we needed was here. Thank you. Hopefully we can come back soon. Aloha, very nice and clean property with a spectacular view,simply sitting on the. Lanai was great. April is a pleasure to deal with, you don't have to call anywhere for your key code or anything else, she takes care of you. Will be back although Kauai is still our favorite. Beautiful clean condo with amazing views! Rates are subject to change. Reservations are fully refundable less a $150 cancellation fee if cancelled 60 days or more prior to check in.